Like the sound of that? Don’t we all! I’m not afraid to admit that I’m a bit of a tornado in the kitchen, making messes at every turn. So any recipe that cuts down on cleaning up is destined to become one of my faves. 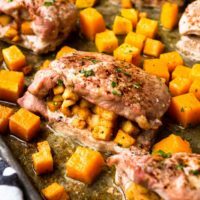 Besides easy cleanup, I also love this apple stuffed pork chops recipe, because it includes a side dish of roasted butternut squash baked on the same sheet pan! 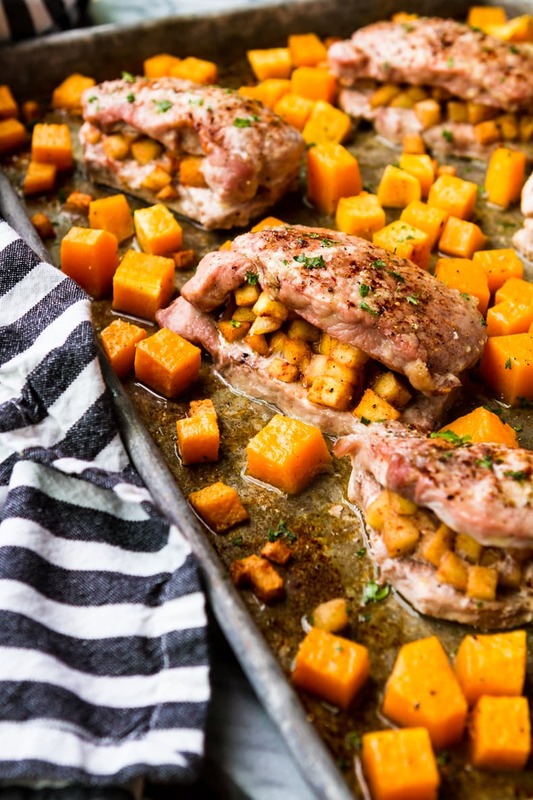 Pork and apples are such classic fall flavors, and when you add in a little butternut squash, it’s like the ideal fall trifecta… Cue all the heart eyes now! For a long time I shied away from sheet pan meals. I simply didn’t think they would work for my larger-than-average family… Well, DUH!!! It finally occurred to me that I could just make TWO sheet pans’ worth, and it’s worked out perfectly. 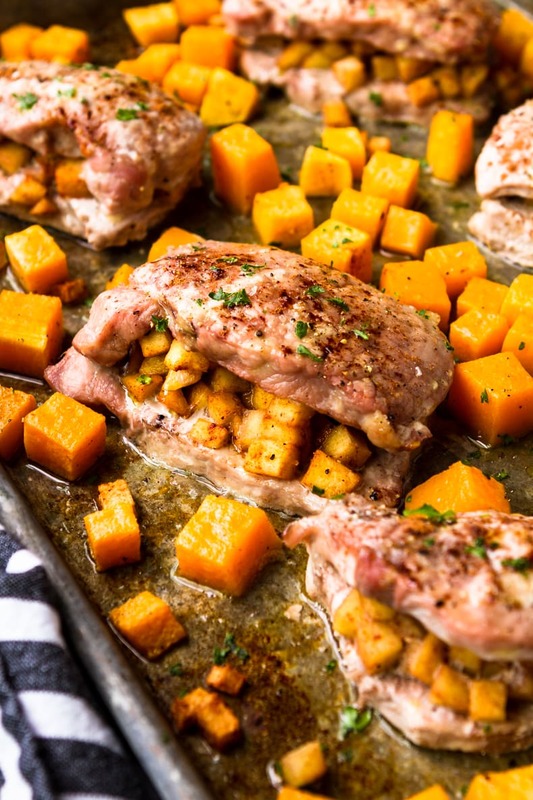 This pork chops with apples and butternut squash recipe makes plenty for a family of four and would easily work for a family of five with smaller children, as well. If your family is on the larger side, like mine, simply make two sheet pans. Any leftovers are perfect for the next day’s lunch! Not all apples are created equal when it comes to baking. It’s very possible that your favorite snacking apple will turn out mushy and bland when baked. And of course, we don’t want to stuff our pork chops with blah, mushy apples! So what are the best apples for baking? Generally, you can’t go wrong with a Granny Smith apple. Their firm texture holds up well when baked, and they retain some of their tart flavor, making them ideal for both sweet and savory recipes. Other good apples for baking include: Jonagold, Braeburn, Crispin, Pink Lady, and my favorite, Honeycrisp. Save money by butterflying your pork chops yourself. Simply buy some thick boneless pork chops, and slice through horizontally with short strokes until you can lay them out flat. Trim the visible fat from the pork chops. While not totally necessary, it does help prevent unsightly globs of fat from accumulating around the chops while baking. Because we eat with our eyes first! Dice your choice of baking apple into small 1/4″ pieces. Keeping the pieces uniform allows them to cook evenly with the short cooking time. Ditto for the butternut squash — 1/2″ to no more than 3/4″ cubes are ideal to keep their cook time in line with the apple stuffed pork chops. Use the same mixing bowl to prep both the apples and the butternut squash. Any spices left in it from the apples only serves to season the squash. Extra apple filling can simply be spooned around the pork chops and mixed in with the squash after baking for added flavor! Since I’m sharing this as a weeknight recipe, I’m keeping things super simple. Spoon the apple filling into the butterflied pork chops, fold over, and then season them with a sprinkle of cinnamon, salt, and pepper. 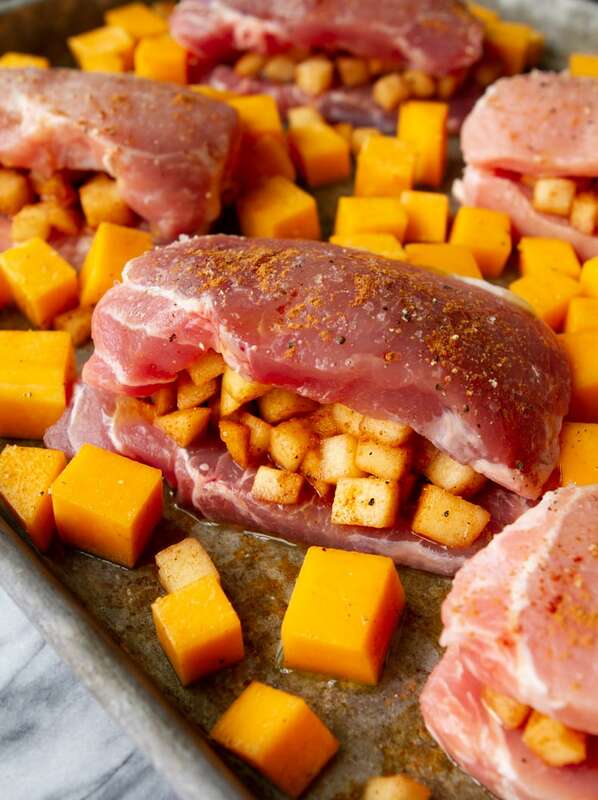 Toss the butternut squash with olive oil, salt, and pepper (in the same bowl you used for the apple filling), and sprinkle the cubes around each pork chop. Then bake! If you’re making this recipe for a classier occasion, you could take the time to sear the pork chops on each side in a skillet, and then transfer them to your baking sheet. You may want to tie them closed with some bakers’ twine if you go this route. Also, keep in mind that this will reduce the baking time, so you may need to remove them from the sheet before the squash is cooked through to keep them from getting dry and tough. And speaking of cooking time, I get asked often how long to bake pork chops… The easy answer is until they reach an internal temperature of 145 degrees — which is what’s recommended by my friends at OhioPork.org. If you don’t have a digital meat thermometer, I seriously can’t recommend this one enough. It’s definitely one of my essential kitchen tools! How long exactly IS that, though? Well, for this recipe it takes between 20-25 minutes. Start checking the chops about 18 minutes into the cooking time, and you’ll never have to worry about dry, overcooked pork again! If the squash isn’t quite tender, pull the chops off, cover them with some foil, and pop the squash back in for a few additional minutes. PIN IT NOW! CLICK HERE TO ADD THIS APPLE STUFFED PORK CHOPS RECIPE TO YOUR FALL DINNER RECIPES BOARD ON PINTEREST! In a large mixing bowl, combine the diced apples, cinnamon, nutmeg, ginger, salt, and pepper. Toss well to coat. Lay each pork chop out flat on a baking sheet, and season with salt and pepper. Place two spoonfuls of the apple mixture on one side of each chop, and then fold the pork chop over to close. Season the top of each pork chop with additional salt and pepper and a sprinkle of cinnamon, if desired. Spoon any leftover apple mixture around the pork chops. In the same large mixing bowl, toss the diced butternut squash with the olive oil, and season with salt and pepper. 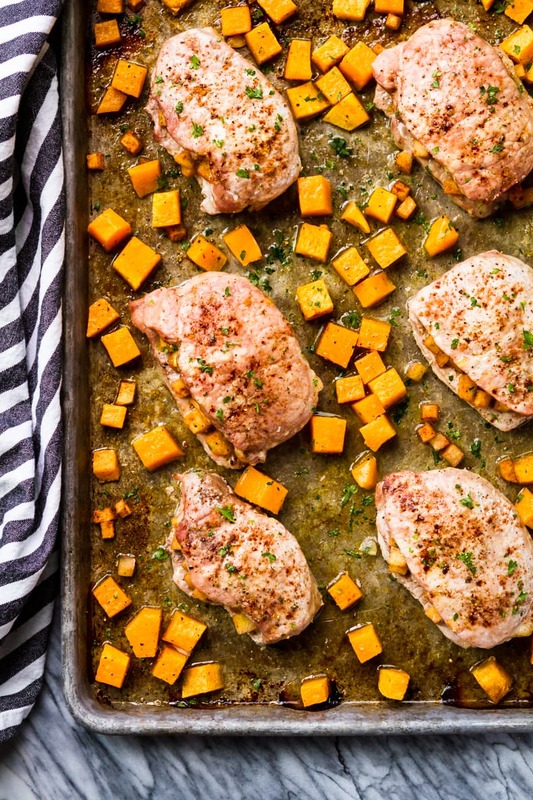 Pour the squash around the prepared pork chops on the baking sheet. Bake at 425 degrees for 20-25 minutes, until the internal temperature of the pork chops reaches 145 degrees. If the squash is not tender, yet, remove the pork chops and cover with foil. Place the baking sheet with the squash back in the oven for a few additional minutes, until cooked through. I’d love to see how your apple stuffed pork chops turn out… Tag me @Unsophisticook on Instagram or use the hashtag #Unsophisticook so I can check it out. Enjoy! Nice recipe. I love it, so nice. I love this sheet pan recipe! Such an easy dinner! Family loves something new for dinner! The apples are perfect with this and nobody even asked what the yummy orange squares are. YUM!! This recipe screams fall! Need to make this soon! I’m glad you provided suggestions for types of apples. It’s so true that different varieties product different results. This looks like a meal I need to try – love all the ingredients! I love the fall flavors you’ve incorporated here. And I’m a bit of a tornado in the kitchen too. My husband says cleaning up after me is cruel and unusual punishment! Ha-ha, that totally made me laugh, Lisa! Love all the fall flavors in this, and sheet pan meals definitely make clean up easier! This is the perfect fall dish! I love apple and pork together! Delicious flavor combination! Great idea to add the butternut squash. I love it and it’ll be perfect with the apples and pork chops. Besides, my husband doesn’t eat squash, that means all the more for me! My husband will tolerate squash, but my boys don’t love it. Like you said, more for me! Well this is my new favorite dinner! Love the flavor combos! This is such a fabulous fall dinner! So tasty! This looks amazing!! That’s something I don’t like about cooking — looking around at my destroyed kitchen that I need to clean up. Yay for sheet pan meals! Right?! Thank goodness my kids are old enough that I can put them to work on it. This recipe has everything my family loves! 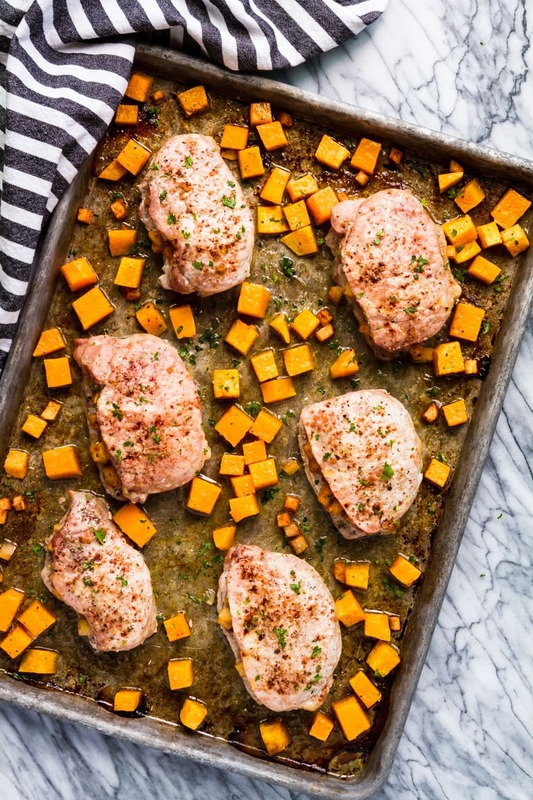 There’s nothing like a great sheet pan recipe – clean up is so easy! I LOVE sheet pan meals. This one was a great way to mix up our menu and I loved the fall flavors. So delicious! Thanks for a great recipe! I love sheet pan dinners. Everything cooks at the same time.